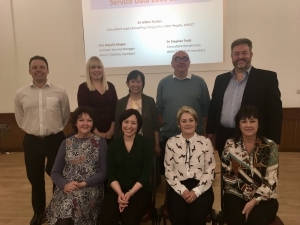 The Health and Social Care Board (HSCB) has been successful in an eHealth and Data Analytics Dementia Pathfinder Programme bid which has been part funded by the NI Executive Office, Atlantic Philanthropies and Department of Health. This Programme has two related strands – one of which is focused on building the capacity to collect and use dementia data to improve the planning and commissioning of efficient, effective and value for money dementia services, and to create a platform that can be utilised to enable data driven care-planning solutions across the health and social care system. Health and Social Care (HSC) organisations. Community and Voluntary sector organisations. Industry and private sector organisations are not eligible to apply as the Lead Applicant; however, they may be contracted by an eligible organisation to undertake elements of a project in accordance with the relevant organisation’s procurement processes. Learning Disability/Sensory Impairment (Hearing Loss). Patient Journey – Pre/Initial referral to palliative care. Between end of July to September HSCB eHealth called for Expressions of Interest for a number of “non-academic or real-life” data analytics projects aimed at improving our understanding of dementia in Northern Ireland and informing better services and support for people with dementia and planning for the future. Altogether there were 47 requests for application packs and 13 submissions were received of which eight were for scoping projects and five were for full projects. Eight projects have successfully received funding following expressions of interest in round one. Back row (left to right): Peter Corscadden (Analytics Engines), Dr Catherine Hughes (Ulster University), Paul Carlin (South Eastern Trust) and Professor Jonathan Wallace (Ulster University). Front row (from left): Dr Frances Duffy (Northern Trust), and Western Trust’s Dr Gillian Mullan, Carmel Darcy and Majella Magee. With them is Soo Hun, from the Health and Social Care Board (back row, centre). Title: Who attends the memory service and what is the outcome of their assessment? Among the successful applicants are: (from left): Dr Ruth Price (Ulster University), Dr Frances Duffy (Northern Trust), Brendan Crossey (Nightingale Analytics) and Dr Sharon Cruise (Queen’s University Belfast). Included is Soo Hun from the Health and Social Care Board (centre). 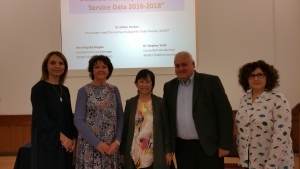 Title: Using the NICOLA Study linked to administrative data to understand how older adults in Northern Ireland transition from MCI to dementia, and to examine equity in dementia-related healthcare access.